The RevoLectionary is a lectionary blog written by Irish young adults. Jan 28 Epiphany 5: Grace in the Homestead. 21 Then he began to say to them, “Today this scripture has been fulfilled in your hearing.” 22 All spoke well of him and were amazed at the gracious words that came from his mouth. They said, “Is not this Joseph’s son?” 23 He said to them, “Doubtless you will quote to me this proverb, ‘Doctor, cure yourself!’ And you will say, ‘Do here also in your hometown the things that we have heard you did at Capernaum.’” 24 And he said, “Truly I tell you, no prophet is accepted in the prophet’s hometown. 25 But the truth is, there were many widows in Israel in the time of Elijah, when the heaven was shut up three years and six months, and there was a severe famine over all the land; 26 yet Elijah was sent to none of them except to a widow at Zarephath in Sidon. 27 There were also many lepers[a] in Israel in the time of the prophet Elisha, and none of them was cleansed except Naaman the Syrian.” 28 When they heard this, all in the synagogue were filled with rage. 29 They got up, drove him out of the town, and led him to the brow of the hill on which their town was built, so that they might hurl him off the cliff. 30 But he passed through the midst of them and went on his way. In today’s age, it's difficult to cut through the noise and sometimes understand the significance of proclamations and announcements. We find the speed to keep up with our world too much, and, in parallel, delivering less and less complexity. I say this to preface the need for Christians, especially in the West, to read their Holy Text with a great deal more patience. Christianity arguably exists and differentiates itself on how Jesus relates himself to these words. The crowd gathered know this…in part. After all, they’re raving and ranting about what Jesus just read and declared. But never let us forget: just because a crowd declares itself to understand the message doesn't mean they've grasped it's full extent and significance. The question the crowd asks, “Isn’t this Joseph’s son?” has been taken in several different directions, either expressing positive surprise, or negative derision. Perhaps the most significant point, however, is the contrast Luke introduces by including this query. He has, up until this point, concerned himself with framing Jesus as God's Messiah, the Annointed One, God's Son. I do not want to suggest that we take one of Jesus’s relational descriptions over the other. I want to suggest, instead, that a) we know Jesus is God’s Son in part by this contrasting tension; and b) that Jesus lived in real time and space, with real relations, including familial and paternal figures. Jesus cuts to the core of the crowd’s ignorance: they think they know what he means when Isaiah’s prophecy is fulfilled in their hearing. They don’t know the half of it. Now they expect the restoration of Israel in its full glory. Now they expect the Messiah to come riding with the armies of heaven to redeem them from the empire by the sword. Now they think their enemies will be crushed. But Jesus prefigures the reach of his message and grace. Drawing on the stories of Elijah and Elisha, Jesus demonstrates that his Gospel is to include those outside of Israel’s family. It is a grace for all, announced in the homestead. And as Jesus says this, the crowd turns on him. Today we want a grace that extends only to those who belong to the family of God. We want Jesus to be for us and only us, forgetting that the Spirit, which hovered over the face of the waters in creation, resides in him, the same Spirit that created the whole world good. It is a grace announced in the homestead, and it doesn’t meet the crowd's expectations. And as a result of their rejection, ironically his message will reach the ends of the earth all the same. 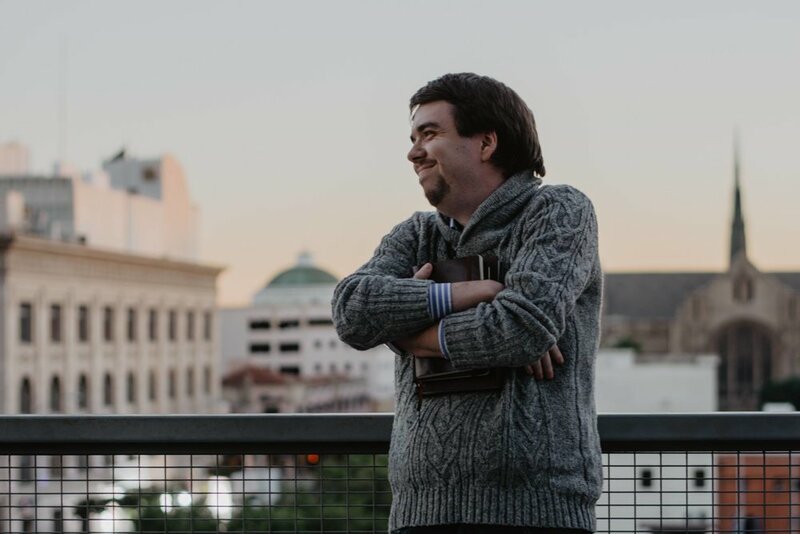 Phil resides in sunny Southern California, having moved from Dublin to pursue a Masters of Divinity at Fuller Theological Seminary. Phil is passionate about the local church, and wants to encourage and develop deep, theological foundations for the conversations and life in the church. When not writing another paper for class, he can be found expanding his whiskey and coffee palette, composing prayer poems, travelling around a small percentage of the U.S., or engaging in another deep life conversation over a pint or two. * Stanley Hauerwas, A Community of Character, 45. Phil resides in sunny Southern California, having moved from Dublin to pursue a Masters of Divinity at Fuller Theological Seminary. Before this, he worked as a business consultant after graduating from Maynooth University (where most of his library time comprised reading anything theological or philosophical). Phil is passionate about the local church, and wants to encourage and develop deep, theological foundations for the conversations and life in the church. When not writing another paper for class, he can be found expanding his whiskey and coffee palette, composing prayer poems, travelling around a small percentage of the U.S., or engaging in another deep life conversation over a pint or two. Feb 5 Epiphany 6: Putting Yourself In Simon's Sandals. The RevoLectionary is a weekly lectionary blog written by young adults in Ireland. Want to become a contributor? Email scott.evans@ucd.ie. With thanks to funding from the Church of Ireland Priorities Fund.